Columbia Industries remains at the forefront of mobility systems for drilling rigs in the Oil & Gas industry with our newest models of the Sprinter Walking System line. Building off of the innovative approach used to create our first Sprinter Walking System in 2017, Columbia Industries continues to innovate with the release of our latest Sprinter models that can provide 4’, 5’, or 6’ of longitudinal movement. This advancement will now enable our customers to achieve a dramatic boost in their overall performance by improving the speed in critical hole-to-hole operations. Our Sprinter Walking System has the capacity to move rigs two to four times faster than other comparable systems. 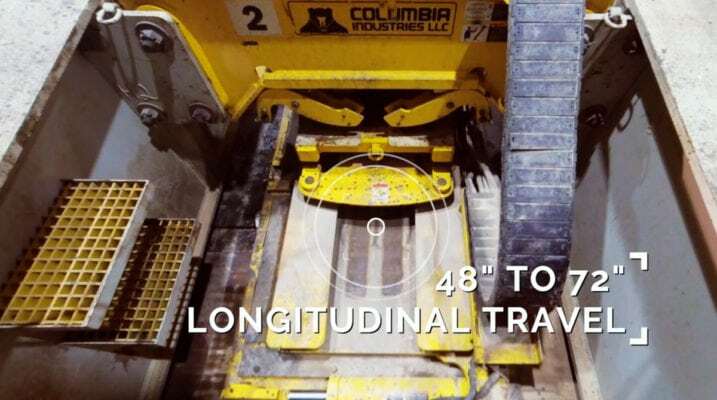 With 48”, 60″ and now 72” of longitudinal travel, precise simultaneous X/Y movement, and complete directional control over all longitudinal, lateral, and diagonal position changes, the Sprinter Walking System give our customers unparalleled control over precision rig placement. Powered by some of the latest and most innovative technology on the market, the Sprinter Walking System is the ideal product to support the ever evolving demands of the Oil and Gas industry. An Advanced Motion Control system that enables simultaneous operation of the X & Y cylinders. A full range of improved speeds allows for 4, 5, or 6 feet of stomper travel, depending on rig structure. The ability to complete a full lateral shift with the longitudinal cylinder in any position. Precision control over rig movement enables exact placement after every step. Larger stomper pads enable lower ground bearing pressures. Self-adjusting sensors that level the rig when walking or lifting. Powered by intelligent design and innovative technology, the Sprinter Walking System offers unmatched power and performance. Contact Columbia Industries today to discover more about how the Sprinter Walking System can help change the way you do business. ← NEW for 2018 -Tippers, Service Programs and Trade Shows…Check it out! NEW for 2018 -Tippers, Service Programs and Trade Shows…Check it out!